We have hundreds in stock. IPower Grow Light Super HPS/MH Dimmable Wing Reflector Sets. Our flawless ratings, feedbacks and praises are not just vouches of excellence but returning customers, ranging from single-light to hundred-light setups, time after time. Choice of the following iPower Ballast. 400W Digital Dimmable Electronic Ballast. 600W Digital Dimmable Electronic Ballast. 1000W Digital Dimmable Electronic Ballast. 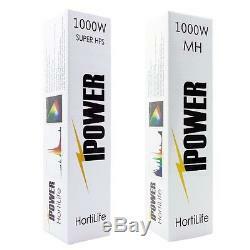 Choice of the following iPower Super HPS / MH Bulbs combos of the corresponding ballast wattage. 1x Super HPS + 1 MH Bulb. 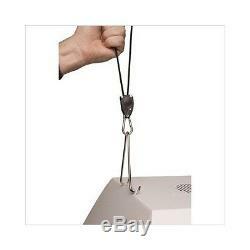 FREE:Heavy Duty iPower Grow Light Flexi Ratchet Hangers. 120V Heavy Durty Power Cord with 240 available upon request. 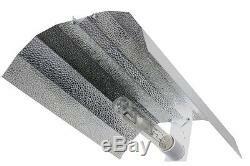 19 Aluminum Wing Reflector w/ Ceramic Socket. H igh quality aluminum panels. Flexible reflector for angles up to 180 degrees. Imprinted convex surface for better light distribution. Built-in 15' heavy duty lamp cord with ceramic mogul socket. Versatile and flexible to install. Ideal for small areas with temperature control. Light can be hung in vertical or horizontal positions. Precise 4'x4' of light coverage. Coverage depends on fixture height and environment; results may vary. Ballast color & shape may vary. 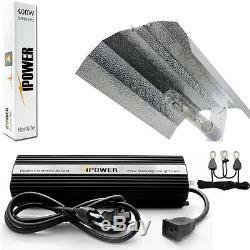 IPower Dimmable Digital Electronic Ballast. Available in 400W, 600W, & 1000W. Conveniently wired with standard hydroponic "S" plug. Operating Voltage Range: 100V 265V. Anodized aluminum fins for maximized heat dissipation. Fully compatible with HPS & MH bulbs. Dimming power settings: 50% (half power), 75%, and 100% (full power). Internal Resin coating for long life. IPower Super HPS / Metal Halide Bulb. Compatible with magnetic and digital ballasts. Can be used indoors or outdoors. Thick glass housing for extra durability. Enhanced wavelengths and lumen power. Ideal for blooming and flowering. 1/8 iPower Flexi Ratchet Hangers. Raise and lower light fixture in one simple movement. 1/8 rope that supports up to 75 lbs of tension (150 lbs total). High quality stainless steel latches. Compatible with all parabolic and round reflectors, as long as hooks and locking latch suit. Perfect for hanging reflectors, light fixtures, carbon filters and ventilation equipment. 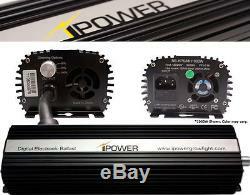 IPower Digital Dimmable Ballast - Available in 1000W, 600W, 400W. Power Supply Frequency: 47 63 Hz. Operating Frequency: 25 100 kHz. Power Factor: > 0.97. Total Harmonic Distortion (THD): < 10%. Crest Factor: < 1.7. Open & Short Circuit Protection. 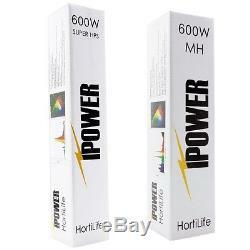 IPower Hortilife Super High Pressure Sodium Bulbs - Available in 1000W, 600W, 400W. Color temperature (K): 2,100. Expected Life(Hr): 24,000 32,000. Bulb orientation: vertical & horizontal. 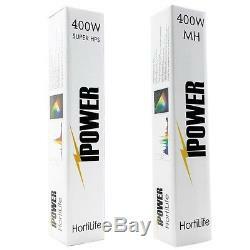 IPower Hortilife Metal Halide Bulbs - Available in 1000W, 600W & 400W. Color temperature (K): 6,500. Expected Life (Hr): 10,000 15,000. 19 Aluminum Wing Reflector with Ceramic Socket. Dimensions (L x W): 18.5 x 18.5. Heavy duty 15 lamp cord. Install Space Requirement (L x W x H): 21.25 x 18.5 x 4.75. Heavy Duty iPower Grow Light Flexi Ratchet Hangers. One Locking Latch for hanging the reflector, the other one to connect the hanger to the ceiling. Up to 150 lbs / 68 kg weight load capacity per pair. Always anchor free end of rope in the unlikely event of mechanical failure. We are located at 13290 Daum Dr. City of Industry, CA 91746. Local pick-ups are always welcomed (by appointment only). The item "IPower 250w 400w 600w 1000w watt HPS MH Grow Light System Kit Dimm Green House" is in sale since Tuesday, May 08, 2012. This item is in the category "Home & Garden\Yard, Garden & Outdoor Living\Gardening Supplies\Hydroponics & Seed Starting\Other Hydroponics". The seller is "hpsgrowlightstore" and is located in La Puente, California. This item can be shipped to United States, Canada, United Kingdom, Denmark, Romania, Slovakia, Bulgaria, Czech republic, Finland, Hungary, Latvia, Lithuania, Malta, Estonia, Australia, Greece, Portugal, Cyprus, Slovenia, Japan, Sweden, South Korea, Indonesia, Taiwan, South africa, Thailand, Belgium, France, Hong Kong, Ireland, Netherlands, Poland, Spain, Italy, Germany, Austria, Russian federation, Israel, Mexico, New Zealand, Philippines, Singapore, Switzerland, Norway, Saudi arabia, Ukraine, United arab emirates, Qatar, Kuwait, Bahrain, Croatia, Malaysia, Brazil, Chile, Colombia, Costa rica, Dominican republic, Panama, Trinidad and tobago, Guatemala, Honduras, Jamaica.